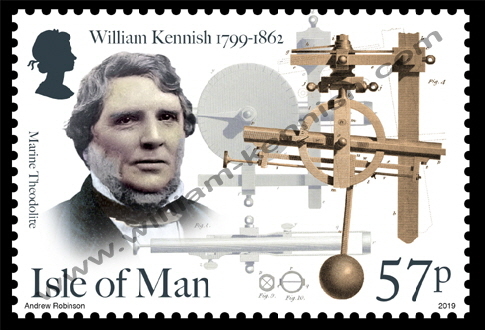 This website owner has worked with the Isle of Man Post Office to mark this key landmark with a stamp issue acknowledging the great works and inventions of six eminent Victorian engineers. (The link may not function after stocks are exhausted). The stamp will be available as a part of the gift set of six or individually from post offices. The 57p shows William Kennish's Marine Theodolite for concentrating the broadside of a ship of war - developed by this Manxman in 1828. See Replica Theodolite. Images used are the early version of his invention as shown in the Society for Arts Manufactures and Commerce yearbook from 1832. It is the world's first centralised gun command system for a warship - when the cross-hairs lined up on the target, the Gun Commander pulled ropes (not shown) which rang bells on all gun decks, signalling the gun crews to fire in unison. The 88p shows Peel-born John Jonathan Kermode with his fuel injector - this allowed diesel or bunker fuel to be injected into fuel burners on ships and railway engines using steam or compressed air. John ran a very successful engineering consultancy from Liverpool in the 1890's and in to the 20th century. His ideas were quickly adopted and later improved - the burner on your oil fired central heating boiler is probably derived from his invention! £1.06 depicts Laxey miner's son John Callow and one of his many bread making machines. He worked in the late 1880's and 1890's to develop the Baker-Callow machinery range and also he invented the Straight Dough process which saved hours off the traditional bread making process. £1.82 presents an image of one of Benjamin Dobson's Carding Machines for his cotton mill in Bolton. Born in Stanley Terrace Douglas, Benjamin returned to his family business in Bolton and was granted many patents for cotton machinery. He was a chartered engineer and also a Lt Col. in the army. He is the only man to have served four terms of office as mayor of Bolton and is probably the only Manxman with a commemorative statue in the British Isles! Raised by public subscription just after his death, it stands over 20ft tall in front of Bolton Town Hall! The £1.97 stamp is the first of two where it proved impossible to locate a photograph of the inventor - so here we show Thomas Cummings Gibson, owner of Ramsey Ship Yard's prime invention - the world's first true oil tanker. The image is from the Leece Museum in Peel and the section is one I created based on written descriptions. A year after he launched the Jane the Euterpe / Star of India. The £2.10 stamp is the other stamp without a face - here we remember Douglas businessman Charles Greenway who in the 1840's patented a free-floating roller-bearing "cage". This kept the balls or rollers in a bearing spaced equally and had very low friction. It is unclear if he ever made any money from it - the next developments here came decades later and today I would not be surprised if there were more than half a million of these in use daily in the Isle of Man alone - billions in use globally - inside every car, truck, bus, electric drill, washing machine, dish washer, pump or wheeled machine!.